Present your best buddy with this cuddly crocheted elephant. The cute crocheted toy adorned with a flower crown makes for a perfect gift for elephant-loving family and friends. It can be attached to a string and used as a bag tag. Or just put it at your bedside table or work desk for a constant companion. In fact, this pattern is an ideal project for people with intermediate crochet skills. They will definitely enjoy working on this fun and rewarding piece. Once finished, the crocheted elephant should measure approximately 6 inches tall. In metric measurements, the completed amigurumi toy should have a height of roughly 16 cm. 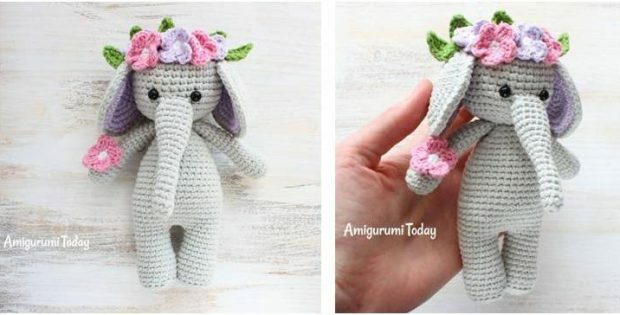 This crochet elephant with flower crown is another wonderful design by the talented crafters over at Amigurumi Today. In fact, you can access the FREE pattern for this adorable crocheted elephant from their website. Featured image: Amigurumi Today – thank you!